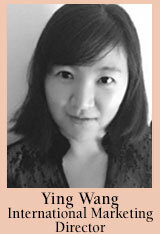 Ying Wang was born in Beijing, China. She graduated from the Affiliated High School of China Convervatory of Music with a major in applied voice. She subsequently earned a Bachelor of Music Business degree from the Berklee College of Music in Boston. She is currently developing and marketing Opera Viva! programs in China.